Venezuelans participated in February 12th in a historic primary election in which they elected the Governor of Miranda Henrique Capriles Radonski as the candidate who will face President Hugo Chávez in October. The process of arriving at a process for unity has not been easy. Primary elections are not new to Venezuelans, but have not been practiced for quite some time, however, the complexity in this case is the primaries this time involved at least five national political parties and independents. 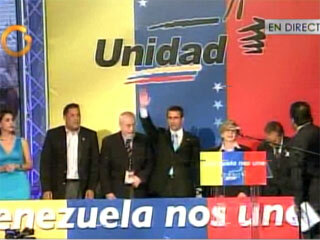 The turnout was also stunning, with 3.075.000 voters participating in Venezuela and 80 cities around the world. Quite remarkable! Learning from past mistakes, it became painfully clear that the only way of restoring democracy to Venezuela was through a process of building unity. This long, often painful process has led us to the February 12 primary election – hosted by the United Opposition grouped under the Mesa de Unidad Democratica (MUD). Yet unity does not end at this pivotal election; but is in fact the time when true unity begins. Through this process of primaries the MUD is offering itself as the alternative for ALL Venezuelan’s seeking to live in peace, prosperity and harmony; irrespective of political ideology, background, race and gender. After February 12th, Venezuelans who want to restore democracy and resolve the country’s social inequalities have a candidate around whom to organize. That is when the hard work begins. President Chávez will use the not unsubstantial power of the incumbency to dominate the campaign period. This will include the abuse of state resources. Already they are distributing electro domestics, welfare checks and signing people up for an ambitious (if deceptive) housing program. During the last presidential campaign, President Chávez’s presence on national TV and radio was 16 to 1 over then-candidate Manuel Rosales. And the tricks don’t stop there. Threatening people in the barrios, harassing opposition members, and even using the intelligence services to attempt to embarrass key opposition leaders are only some of the methods of electioneering. But why would the Venezuelan regime bother to do all this? There are two, simple reasons. First – President Chávez could lose even under this electoral asymmetries and the padding of the electoral registry. While the system is stacked against the opposition, it is still possible that through massive turnout and an organized movement to defend votes, President Chávez will not be able to fake, lie and impose fraudulent results. The opposition proved this in 2007 when the critical constitutional referendum was lost by the regime; but also more recently in the 2010 parliamentary elections when the opposition coalition accounted for 52% of the vote. Even though the government uses persecution and intimidation in several communities, citizens are organizing to defend their votes in each polling station. This structure has grown significantly in the organization of the primaries. However, international observation, cooperation and monitoring are necessary to ensure that votes are counted and that citizens are not harassed. Second, in a fight where people overcome their fears, he would lose. The majority of Venezuelans are tired of violence, shortages, unemployment, division, hatred, and conflict. And unity creates an enthusiasm that defeats fear and intimidation. This was proved in the last regional elections, where Diosdado Cabello, the powerful second in command of the so-called revolution, lost to current Governor and presidential hopeful Henrique Capriles Radonsky. Therefore, while the path is difficult, with participation and unity will we see the Venezuelan people reclaim their future. This process begins with the primaries today. And now, more than ever, the solidarity of the international community is needed. As we celebrated the 10th anniversary of the OAS democratic Charter, the friends of Venezuela need to act upon the charter to ensure that votes are counted and that constitutional democracy is at long last respected in Venezuela.